Located on Jacksonville's Westside, Woodstock is a early 20th century working class neighborhood home to a diverse collection of historic residences and architectural styles. Woodstock Park is a neighborhood along West Beaver Street where heavy industry still flourishes with residential homes in close proximity. The Westside neighborhood dates back to the early 20th century as a result of Jacksonville’s rapid outward growth between the Great Fire of 1901 and World War I. Platted in 1917, with streets named after Great Lakes waterways such as Erie, Superior, Huron, Mackinaw, St. Clair, and Detroit, the neighborhood was considered to be located along the gateway to Jacksonville for those arriving from the west. 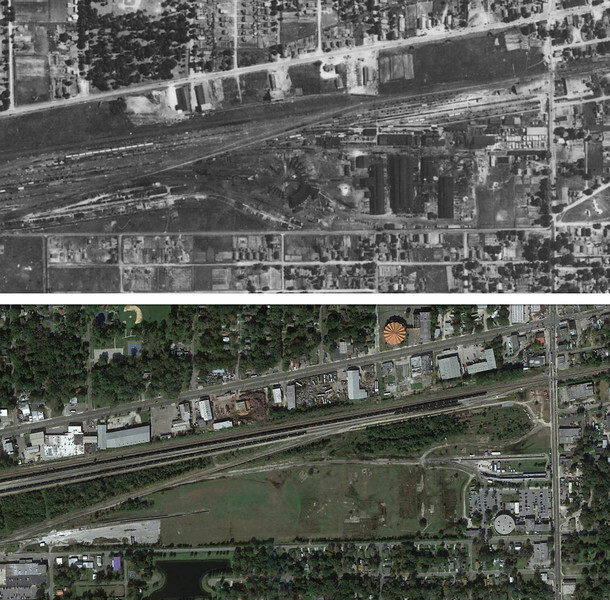 Located just south of West Beaver Street and Woodstock Park, the Seaboard Air Line Shops and Terminals (top aerial taken in 1943) once included diesel locomotive shops, steam locomotive shops, and a 165’ turntable. Operations ceased in 1985 and what remains of the adjacent West Jax Yard (bottom aerial taken in 2016) is primarily used for receiving Conrad Yelvington rock trains. Situated between Edgewood and McDuff Avenues, Woodstock Park was within close proximity of three major rail yards and shops operated by the Seaboard Air Line (SAL), Atlantic Coast Line (ACL), and Southern Railroads. Nearly a decade before the platting of Woodstock Park, the SAL railroad shops on the south side of Beaver Street had already become one of the city’s largest employers with 1,000 workers in 1909. North of Woodstock Park in neighboring Allendale, the ACL and Southern railroads operated their railyards at Grand Crossings along Old Kings Road. The platting and development of Woodstock Park allowed workers to reside in modest homes within short distance of their places of employment in an area where Jacksonville’s streetcar network was not readily available. A $1 million bond issue approved by Duval County voters in 1915 for the construction of 12 grammar schools also provided the area with an educational amenity, providing the funds necessary to build Public School No. 21 (Annie Morgan Elementary School) at the intersection of Commonwealth Avenue and St. Clair Street. 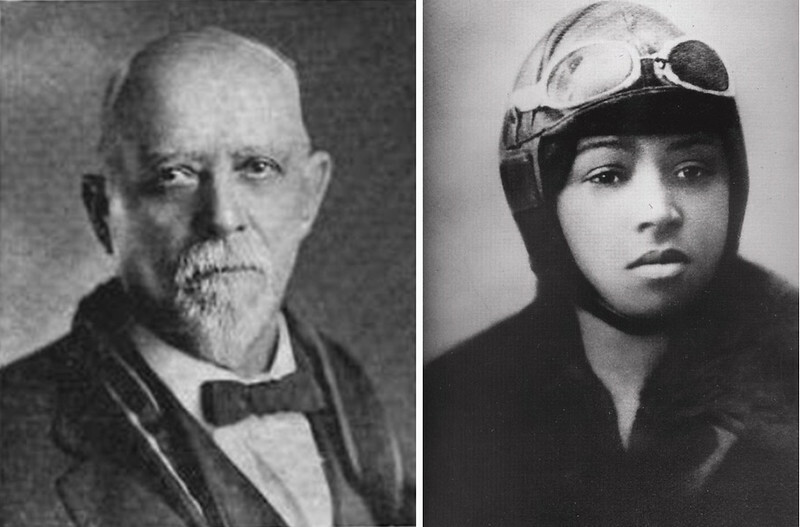 Samuel J. Melson (left) and Bessie Coleman (right). Courtesy of Wikipedia. Much of the area’s history is intimately integrated with the history of the Melson and Paxon families. Samuel J. Melson, the president of the S.J. Melson Company (real estate) was one of Jacksonville’s most prominent businessmen during the early 20th century. Born in Bedford County, Virginia, Melson relocated to the Jacksonville area engaging in stock and real estate. Melson’s son, David, was the S.J. Melson Company’s vice president, who built one of Woodstock’s oldest remaining residences at 978 Melson Avenue (SW corner of Melson and Commonwealth Avenues) in 1916. Edward H. Paxon served as the company’s secretary, owned real estate firm James & Paxon and was also married to Melson’s daughter Lily Fay. For many years, she owned Paxon Field, which was also called Melson Field; it was one of the city’s first airfields. Tragedy struck on April 30, 1926 when Bessie Coleman (the world’s first licensed black pilot) was killed in a plane crash while on the barn-storming circuit. During a test flight, Bessie’s Jenny (airplane) went into a nosedive and Bessie was thrown from the plane to her death. During World War II, the airfield was used by the Navy as an outlying airfield for Jacksonville NAS and the training command. After the war, the airfield was sold to a developer who set aside the property for future schools. In 1954, Paxon Field Junior-Senior High School opened to serve the city’s rapidly growing Westside. 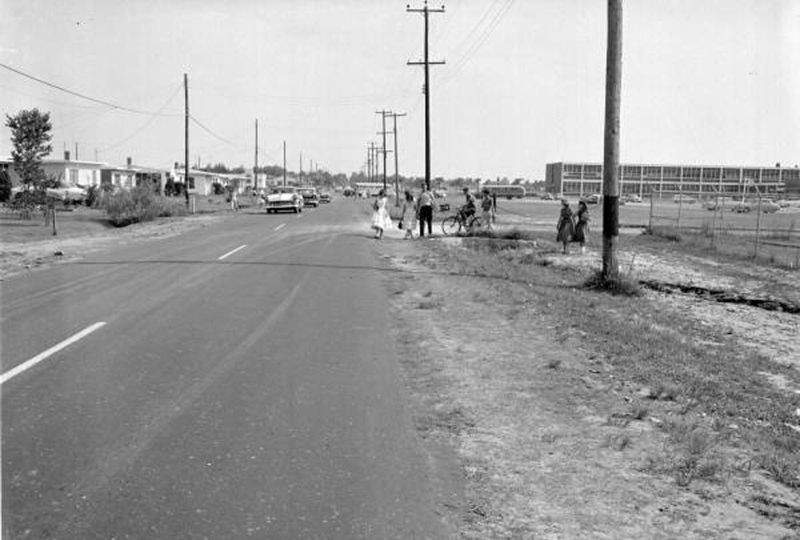 Students walking from Paxon High School on Melson Avenue in 1958. Courtesy of the State of Florida Archives. 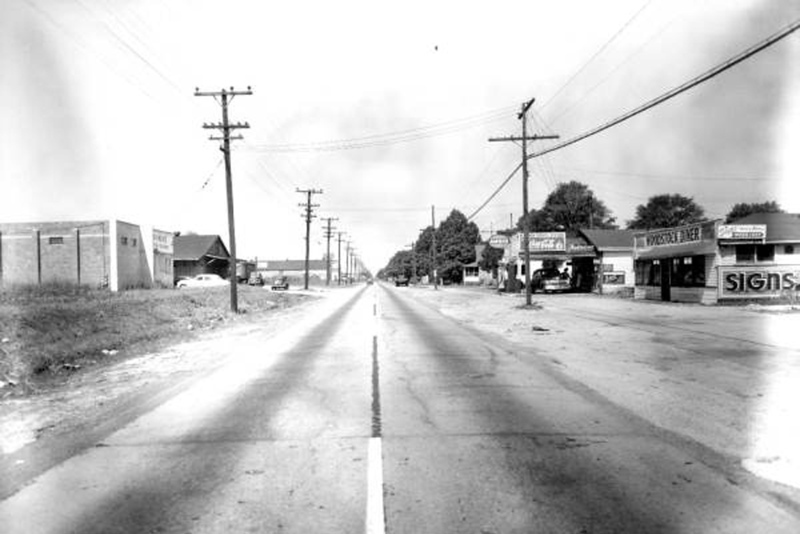 In 1925, the neighborhood was annexed by Jacksonville and remained the city’s western border until consolidation in 1968. Shortly after its annexation, nearly 16 acres in the heart of the neighborhood was deeded to the City of Jacksonville to serve as a park called Woodstock Park. A popular public space today, Woodstock Park is known for its Edith Ford Brown Community Center, baseball field, basketball, tennis courts and playscapes nestled under towering pine and oak trees spread throughout the grounds. As a part of Florida’s first municipal comprehensive plan in 1929, the neighborhood was zoned as a “Residential A” district with commercial uses allowed along Beaver Street east of Woodstock Park. South of Beaver Street it was zoned for heavy industry. The Woodstock Diner on West Beaver Street in 1948. Courtesy of the State of Florida Archives. Despite dating back to the early 20th century, the area’s greatest period of growth came as the automobile increased in popularity. In 1958, the neighborhood became one of the first in Jacksonville to land a major shopping center catering to the automobile. Developed by Sam Morris Spevak, Paxon Shopping Center opened in 1958 on Edgewood Avenue. Built around a large surface parking lot, original tenants included A&P Foods, Economy Five and Dime Stores, and Western Auto. The area also benefited from additional industrial growth surrounding nearby railyards. By the 1960s, the list of companies operating in or near Woodstock Park included H.W. Lay Company, Florida Feed Mills, Florida Georgia Tractor Company, Coca-Cola Bottling Company, and Tropical Glass and Box Company. H.W. Lay & Company’s 1940s acquisition of Barrett Food Company’s Woodstock plant at the SAL’s West Jax yard helped make them the largest manufacturer of potato chips and snack foods in the United States. Today, Woodstock Park is no longer a gateway to Jacksonville. In 1961, Beaver Street’s role in importance was reduced permanently with the opening of Interstate 10 between Jacksonville and Sanderson. However, the crossing of railroads that originally attracted early industry in the area still remain, retaining much of Jacksonville’s manufacturing base in close proximity to Woodstock Park. These lines are now owned by Norfolk Southern and CSX, both of which still operate large rail yards in close proximity. Throughout the neighborhood’s past, it has remained a working class community complementing nearby industrial facilities and railroad yards.